Try Quick & Easy Skillet Pork Chops for a tasty pork dish for the whole family. 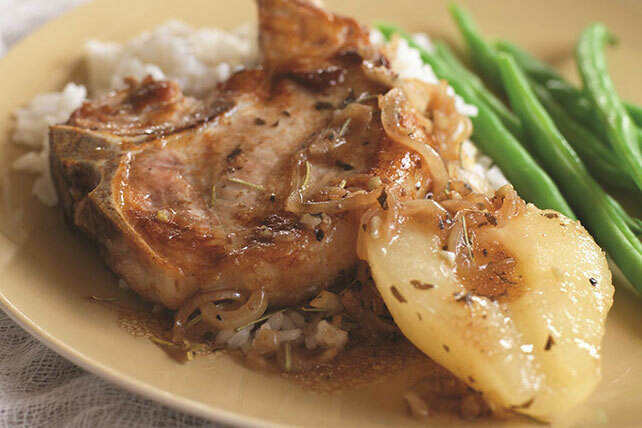 These delectable skillet pork chops will be ready in a flash. Cook chops in oil in large nonstick skillet on medium-high heat 3 min. on each side or until browned on both sides. Remove chops from skillet; set aside. Add onions, garlic, rosemary and 2 Tbsp. dressing to skillet; stir. Cook 3 min., stirring occasionally. Return chops to skillet. Add pears and remaining dressing; simmer on medium 10 min. or until chops are done (160ºF). Serve chops topped with the sauce. Serve with hot cooked rice and steamed green beans. Prepare using KRAFT Light Red Wine Vinaigrette Dressing.